I often think Facebook is paid by tourism companies to mock my office existence and exaggerate how often my “friends” are on overseas holidays. But ABS figuressuggest Australians really are crossing customs at climate changing rates. 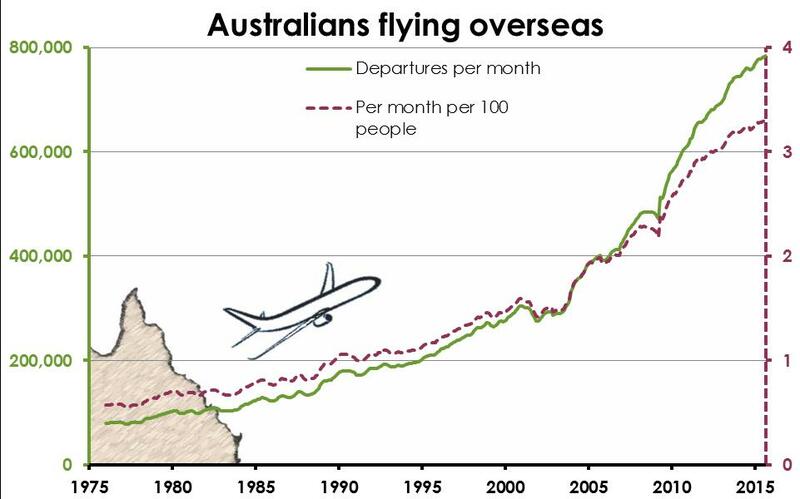 Australians flew overseas 9.3 million times in the 12 months to September 2015. That’s almost 800,000 departures per month. Or in Facebook terms, you can expect more than 3 out of every 100 Aussie friends to travel overseas this month: that’s a myriad mates munching at the Marrakesh markets; a bunch of selfies from Boracay’s beautiful beaches; and the occasional insightfully witticism of the commercialist culture capturing Kolkata. Australians have long been early adopters of international flights. The first England to Australia flight took place almost a century ago, in 1919 (taking 28 days). Overseas flights, however, have really taken off in the last decades. The number of Australians flying overseas has doubled since 2006, and increased ten-fold since 1977. Accounting for the population grow, trips per capita have doubled since 2004, and grown six-fold since 1977. There are many ways of interpreting these figures, depending on what angle / lens / issue you care to focus on. We could suggest that whilst Australians (according to pop media) are deeply concerned about economic instability and slowing wage rises, they have nonetheless increased their international holidays by 50% per capita since the Global Financial Crisis. Not all cuisines are created equal. Certainly not according to the Australia voting public at least. 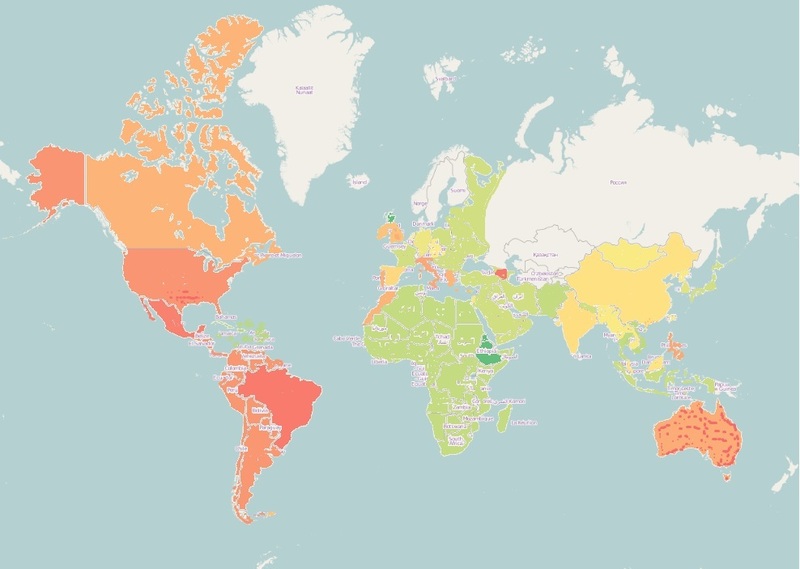 Following on from “Stirring the data with an urban spoon” (an analysis of urbanspoon data), this map compares popularity of different cuisines across the globe. NB: Controversial borders do not reflect the views of the author, rather an attempt at standards. Some questionable boundaries (Islas Malvinas/Falklands Islands, Cyprus) were represented in dual colours. Some countries (Australia, China, United States) appear to have rubella. This is because their cuisines were described multiple times. Australia came under “Modern Australia” (in orange) and “Native Australia” (a slightly darker shade of orange). Some countries’ cuisines were individually defined (Thai, French, Moroccan, Brazilian), while others came under umbrella tags, such as “Africa” or “Latin America”. Others were missing entirely from the list (eg. New Zealand, Sri Lanka, Russia, Sweden). One of life’s great tragedies is the limited opportunity for meal consumption, usually estimated at 3 per day. The seriousness of such a condition is accentuated when travelling through cities at fast pace. 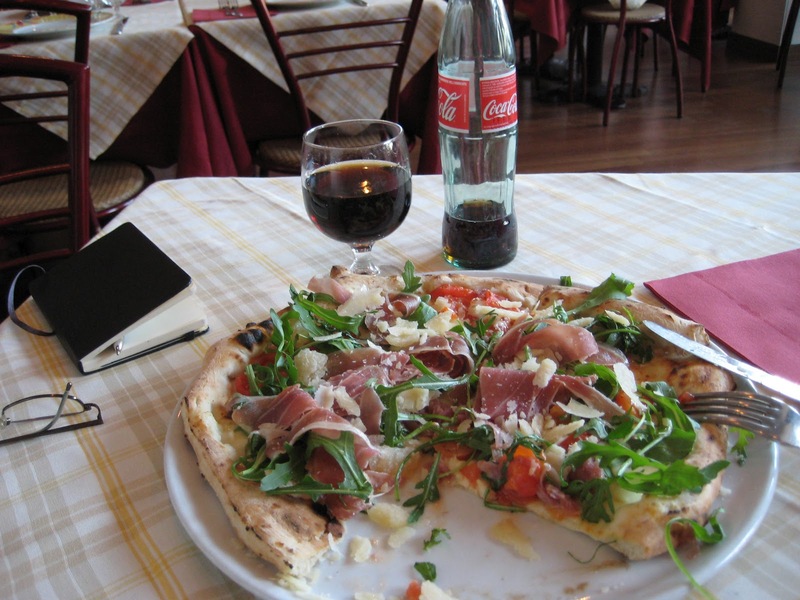 Having failed to find an adequate pizzeria on the first of a two-day fly by Napoli, the alleged birthplace of such fine cuisine, the pressure mounted on my second day. Without the three-meal-per-day phenomenon I could have tried every pizzeria I walked past, but knowing I would only get one crack at it, the choice would define my soon-to-be memories of this wonderful city. The three-meal standard was once again proving a major limitation on my savouring life. After hours of walking, pizza napoletana. I walked up and down the Neapolitan streets in search of this fabled slice, finally giving up as the sun was setting, mostly due to hunger, anger, and my train’s imminent departure. In a final bout of desperation I succumbed to the type of ‘cheesy’ touristy pizzeria I would otherwise arrogantly lift my nostrils at. Not even the world’s best table red (coca cola) could help me wash down the shame and disappointment. Back in home territory the opportunities to try the local cuisines might not be so limited (numerically speaking), but the desire to maximise every outing still holds. Over the years I have realised that a restaurant’s reputation is not a great predictor of satisfaction. Neither is the size of its queue. But perhaps among the masses lie some nuggets of truth for us to take away. Websites such as urbanspoon provide peer reviews rather than the “hat” dispersing scriptures dividing good food from evil. Usually used to check out restaurants individually, the data held by these online voting booths can surely tell us more about our candidates. While not including every restaurant in Australia, the 22,297 profiled in capital cities across the country appear to constitute a majority of the population. According to a quick search in the Yellow Pages there are 31,900 “Restaurant and Cafes” across the capital cities, and an ABS publication estimates the figure at 15,423 in 2007. While the scopes and definitions might differ slightly, the figures suggest it’s a decent sample. 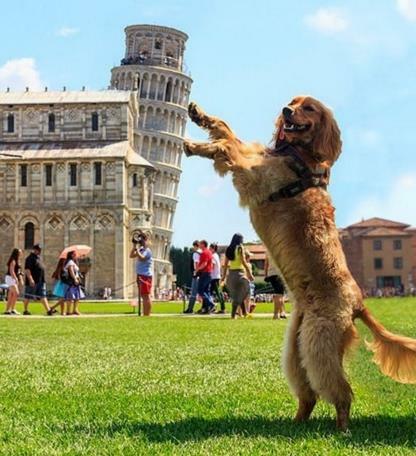 Reviewers are generally positive creatures. Cost driven expectations are not matched by experience. If you love your steaks, eat at home. 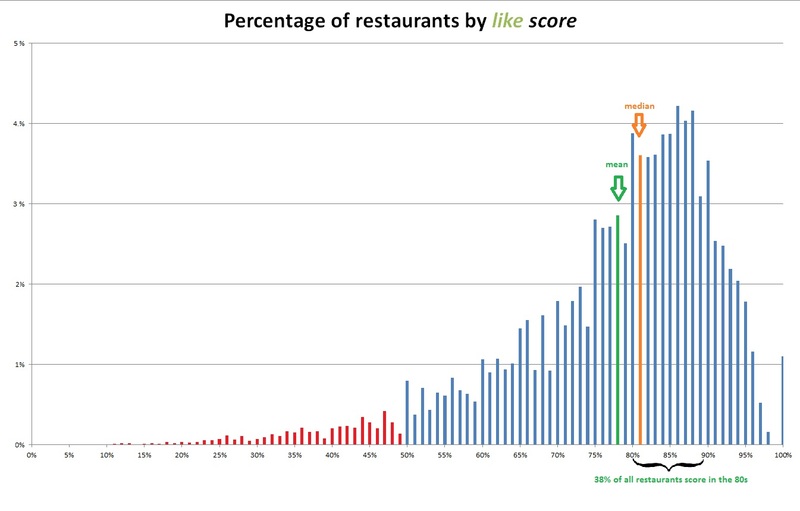 Urbanspoon’s rating system is expressed as a percentage of the people who liked it vs. those who disliked it. On average restaurants get liked 78% of the time. This average “like score” is consistent (+/- 3%) across all capital cities*. While almost 40% score in the 80s, less than 5% of restaurants have scores under 50%. Surprisingly, these positive reviews are less likely for the expensive restaurants than el cheapo ones. The elevated expectations which come with paying extra seem to lead to disappointment.Overall, cheap restaurants score 9 percentage points more than expensive ones, with the middle ranges falling in between. This trend occurs not only across all capital cities*, but also across most cuisine types. Cheap Thai beats expensive Thai, but then again cheap Thai beats pretty much everything!French restaurants (and to a lesser extent Japanese) seem to disturb the pattern. Of the cuisines with large enough sample sizes, les French are one of the only cuisines not to show decreased satisfaction likelihood with increased price, keeping a steadily high level across all price ranges (80% like). So why pay more if we’re less likely to like it? The difference in price is not insignificant, so if these data are anything to go by: cheap is cheerful, and pricey just makes disappointment more likely. Sometimes we don’t crave fancy or convoluted: forget the foam and the parfait, the cocktails and pate. Sometimes we just want a bit of steak (aged, of course, wagyu if possible). In that case, do not head to a steakhouse. Of all categories of restaurants on urbanspoon, steakhouses fare the worst with an approval rating of just 69%!How hard can it be?Perhaps it’s because it doesn’t come with the scent of closely mowed grass, but as simple as a steak is to serve (usually with a side of chips and mushroom sauce) steakhouses just don’t cut it. On the other hand vegetarian restaurants score 80%, up there with Turkish, Korean, and Fish and Chips! * When discussing capital cities, Hobart, Darwin and Canberra are excluded due to their small sample size. Today is the fifth day of the 2011-12 Christmas holiday road toll period¹ and it is hard to open a newspaper or news website without being informed that so far 18 people have lost their lives on Australian roads since last Friday. According to the World Health Organisation (WHO), road traffic accidents amount to over 1.3 million deaths per year, and injure in excess of 50 million people. They are the biggest killer of people aged 15 to 39 worldwide, and ranked around 9th overall². Worst of all, these figures are expected to increase over the coming years, mostly due to the growing access to vehicles in the developing world*. These facts make road safety a worthwhile focus of media attention. What makes less sense is the misleading obsession which the media has on the holiday periods. By focusing so overtly on the Easter³ and Christmas periods, it is assumed by the public that they claim more lives than other times. Headlines speak of the climbing toll, morbidly focusing on every death recorded during the period. They even include a state by (vs.) state tally, and each police jurisdiction either congratulates their constituents, or shows their disappointment, depending on how their stats is faring. What they rarely report, however, is that the holiday periods are nothing special. If anything, the Easter and Christmas periods claim less lives than similar periods throughout the year. Based on data published by the Department of Infrastructure and Transport 4 (Commonwealth level), the Christmas/New Year holiday period claims an average of 67 lives per year (since 1989, which is the earliest freely available data). The average for a similar period throughout the year is 70. Similarly, the Easter period claims an average of 22 lives per year, while 24 die on similarly lengthed periods the rest of the year. Christmas day itself falls in the lowest 5% of days in terms of deaths, in the period 1989-2010. The month of December does appear to be slightly more deadly than the rest of the year, but surprisingly it is the period before Christmas which makes it so. By the time we first hear about the Christmas road toll, the worst has passed. Similarly, March is worse than April, meaning the Easter reminder comes too late. The calendar below shows the average number of road fatalities for each day of the year, for the period 1989-2010. The cells are colour coded, with green having the smallest number of deaths and red being the deadliest. Unfortunately, the road toll is devastating every week, not just when the media decides to focus on it. During the last two decades, an average of 34 people died on Australian roads every week. Most of the accidents which claimed lives occurred during the weekends. Saturdays claim 63% more lives than Mondays and Tuesdays. Fridays and Sundays aren’t far behind. If the media (and law enforcement agencies) want to focus their attention on a particular period (double demerit points, increased breathalysers, etc. etc.) then perhaps every weekend is as good as the others. This would send the message that the roads are dangerous throughout the year, not just on holidays. NB: As the numbers represent the average from 1989 to 2010, the day of the week they land on changes from year to year. For presentation purposes, this calendar is based on the 2010 layout, with the 29th February added for completeness. * Conversely, one could argue that since the trend is due to expanding access to motorised vehicles, a growing road tally in the developing world is a horrible side effect of great progress, bringing with it increased freedom of movement, greater access to trading routes, and generally higher quality of life. 1. Christmas/New Year holiday period begins at 00:01 on the last Friday before December 25, and ends at 23:59 on the first Friday after December 31. 3. Easter holiday period begins at 00:01 on Easter Thursday and ends at 23:59 on Easter Monday. I’m not usually one to plan in advance nor buy in bulk, but with regards to Melbourne’s public transport, I might be convinced otherwise. Last week’s announcement of the upcoming 9% increase in train tickets (as well as bus and tram) has compelled me to buy my 2012 train tickets at what are still genuine 2011 prices. Over the past two decades, Australia has kept inflation between 2 and 4% per annum. And yet, I find myself reminiscing the days when I could purchase a book of 10 bus tickets for $4.50. Being mindful of the concession price variable, and the fact that I was still wearing Brut (high school boys’ top selling deodorant!) the $4 per ticket I will be paying come January still appears a little inflated. To get a better idea of how this latest increase fares, I compared it to previous movements. With public transport data going as far back as 1972, the ABS’ CPI shows an interesting trend over the past few decades. Throughout the 70s and 80s the increase in public transport prices mirrored that of the overall basket of goods. That is to say, the price of catching a train increased at similar rates to most other common goods. From 1990 onwards, however, the cost of buses, trams and trains has increased at a rate much higher than inflation (which includes housing costs, education, bananas, recreation and health, etc etc). While the cost of living in Melbourne increased 79% since 1990, by the time I sober up on New Year’s day, Melbourne’s public transport will have increased 190% in the same period. Public transport’s elevated inflation is not only a Melbourne issue. Public transport has outgrown inflation by 97% across all of Australia’s capital cities. The graph below shows how Australian capital cities fare in terms of transport inflation compared to the overall Australian CPI. In the meantime… here is a temporary graph with similar data. This phenomenon is made more remarkable when considering that the inflation for private motoring costs (including vehicle costs, fuel, parking, registration etc) has been lower than the total basket over the last few years. 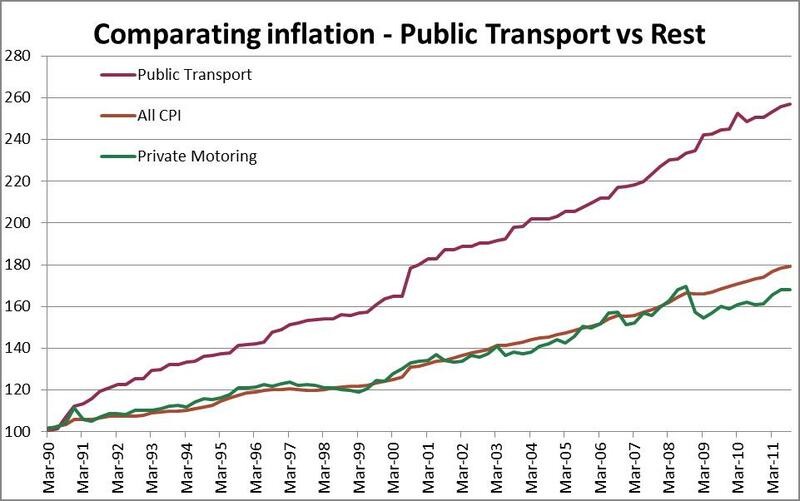 While the increase in cost of public transport is almost twice that of the overall basket, private motoring costs have increased 15% less than CPI since 1990. I won’t speculate as to the reasons for this divergence. Suffice to say that if we’re trying to encourage people to jump on the public transport bandwagon, a little economic incentive wouldn’t hurt.